This week, io9 is teaming up with Marvel Comics to celebrate the release of Uncanny X-Force #18, the final issue of author Rick Remender's eight-part mutant epic "The Dark Angel Saga." This issue promises to have longstanding ramifications for founding X-Man Archangel, who's been almost irrevocably corrupted by the supervillain Apocalypse. But before we delve into all things "Dark Angel Saga," who exactly are the X-Force? Are they the X-Men with bad manners? Isn't Cable a member? Don't the British royals have a bone to pick with them? The truth is, X-Force has always been on the fringe of the X-Men. That's no small feat, as the X-Men were once dubbed as "The Strangest Super-Heroes of All." Whether battling anti-mutants bigots, starring in their own reality show, or toting spine-crushingly big laser bazookas, it's perpetually X-Force's day job to attract mortal peril. Here's their quick and dirty history. 1991: X-Force #1 (by writer Fabian Nicieza and artist Rob Liefeld) hits stands. The series is a spin-off of the duo's previous work on New Mutants, a comic about a group of green-around-the-ears X-Men in training. The last few issues of New Mutants set the stage for the formation of the X-Force roster. This X-Force consisted of former New Mutants members like Cannonball and Tabitha "Boom-Boom" Smith and new characters like the mercenary Domino and cross-dimensional warrior Shatterstar. Also, New Mutants #98 (below) introduced readers to a snarky assassin named Deadpool, whose shenanigans would become part and parcel of the X-Force mythos. The Liefeld-era X-Force saw the X-youth in revolt. Under the leadership of the cyborg telekinetic Cable — who readers would later learn is Cyclops' son — X-Force adopts a paramilitary stance to supervillain crime. The group also cuts formal ties with the X-Men, who end up battling (and defeating) X-Force early on. During this time, X-Force sold like gangbusters. Five million copies of the first issue flew off the shelves, making the young Liefeld one of the most coveted artists in the industry (which in turn earned him a Levis jeans commercial directed by Spike Lee and a guest appearance on The Dennis Miller Show). In 1991, Liefeld eventually left Marvel to co-found Image Comics, putting X-Force in Nicezia's hands until 1995. Some other colorful things to happen during this period were Mike Mignola's supporting pencils on X-Force (top) and the now-nonsensical What If? comic What If Cable Had Destroyed The X-Men, which featured a ton of X-characters kicking the bucket with reckless abandon. 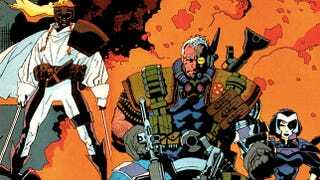 1993-2000: After the X-Cutioner's Song storyline, fan favorite Cable left X-Force to star in his own comic. During these years, X-Force membership remained fluid. For example, Cable returned and then quit again to join the X-Men (with Cannonball in tow). Former New Mutants cast members like Karma and Danielle Moonstar would drop by for a few issues. With Cable gone and new teenage mutant book Generation X on the stands, writers like Jeph Loeb and John Francis Moore played up the twentysomething superteam angle. Warren Ellis even did some plotting in 2000, recasting X-Force as an espionage-tinged strike force under the aegis of super-spy (and Kitty Pryde ex-boyfriend) Pete Wisdom. 2000-2004: In a demented change of pace, author Peter Milligan (Enigma) and artist Mike Allred (Madman) radically revamped X-Force. Their run used absolutely none of the prior team members. Instead, Milligan and Allred focused on a new, corporate-owned mutant superteam whose main concerns were franchising and Q ratings. These cynical mutant fameballs died with comedic frequency. Hell, the team's first iteration was slaughtered in the first issue of Milligan's run. This X-Force team was eventually rechristened as the X-Statix until the series was cancelled in 2004. Fortunately, the X-Statix omnibus is out later this month, commemorating one of the weirdest times in mutant history. Milligan and Allred's run courted plenty of praise and controversy. It was pretty audacious for Marvel to rebrand one of its most venerable ongoing mutant teams as a gang of self-obsessed media whores. Some fans were enraged or confused where the original X-Force went. Hilariously enough, the old X-Force too was pissed that these pretenders had appropriated their name, so they attacked the new X-Force tout de suite. The British royals balked when Peter Milligan attempted to add a back-from-the-dead Princess Diana to the team. This protest put the kibosh in Milligan's planned script, a development he's still a twinge chagrined by. Read an exclusive preview of Red Lanterns, starring the Green Lanterns&apos; blood-vomiting rivals! 2008-Present: The X-Force brand went on hiatus for a few years, save the occasional miniseries by the old team of Liefeld and Nicieza. In 2008, a new X-Force series by Craig Kyle and Chris Yost debuted. Unlike prior X-Forces, this incarnation of the team had explicit ties to the X-Men. After the Messiah Complex event, Cyclops commissioned this new black-ops, wetworks X-Force to neutralize any threats to mutantkind preemptively. The initial roster consisted of Warpath, Wolfsbane, Wolverine, and X-23. When this covert hit squad's cover is blown, Cyclops disbands the team. Never one to listen to directions, Wolverine recruits his own team — the Uncanny X-Force — consisting of Archangel, Psylocke, Fantomex, and Deadpool (who's never one to turn down a paycheck). Rick Remender took over writing duties in 2010. The big excitement during his run has been the rebirth of Apocalypse, the newfound villainy of longtime good guy Archangel, and a revisiting of that hellish alternate reality known as The Age of Apocalypse. We'll be chatting with Rick about all matters Uncanny X-Force tomorrow. Til Tuesday, true believers!